For many young women, high school prom is a pivotal coming-of-age ritual. An iconic American cultural life event. But, current state of our economy, high unemployment rates and the rising costs of attending prom, leaves many young women feeling frustrated and many times unable to attend prom. The Fairy Godmother Initiative was started in 2008 by Myra Roldan and Cheryl Monk along with the girls at Lauralton Hall Academy in Milford, CT. The girls of Lauralton's first radio station collected dresses for the first dress boutique. We received 5 dress donations from New York Designer, Jason Wu and our first event was a high spirited and emotional event. 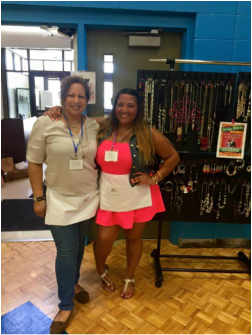 Due to demand, a second dress boutique day was held a few weeks later at Sacred Heart University with the help of Myra's daughter, Jean-A'Layn (Jeana) Segalla, Delta Phi Kappa Sorority, Inc. and Sacred Heart Residential Life. In their first year, they were able to provide a free dress for prom to approximately 350 girls. Since 2008, they have partnered with several organizations to host our events in Connecticut. Myra and her daughter Jeana have worked very hard to keep the organization in operation and continue offering girls a free dress and accessories for Prom. Each year they strive to collect more dresses than the year before and are able to open their event to young women young women from surrounding states and host an event in New York in partnership with the Department of Probation South Bronx Neon. In 2010, they partnered with the Connecticut Association of Foster and Adoptive Parents to host a special event for young women in foster care. In 2012, they opened their event to 8th grade girls who were being promoted or graduating to High School. They understand that this is also a very important event in a young girls life as it is the beginning of a life transition and coming-of-age event, as well. Each year young women from Connecticut, New York, New Jersey, Massachusetts, and Rhode Island attend Fairy Godmother Initiative Prom Dress Boutique events to shop for a free dress for prom; in return they "Pay It Forward" by bringing donation item from the Fairy Godmother Initiative wish list. All donation items are collected and then given to a local family/women's shelters and local food banks.